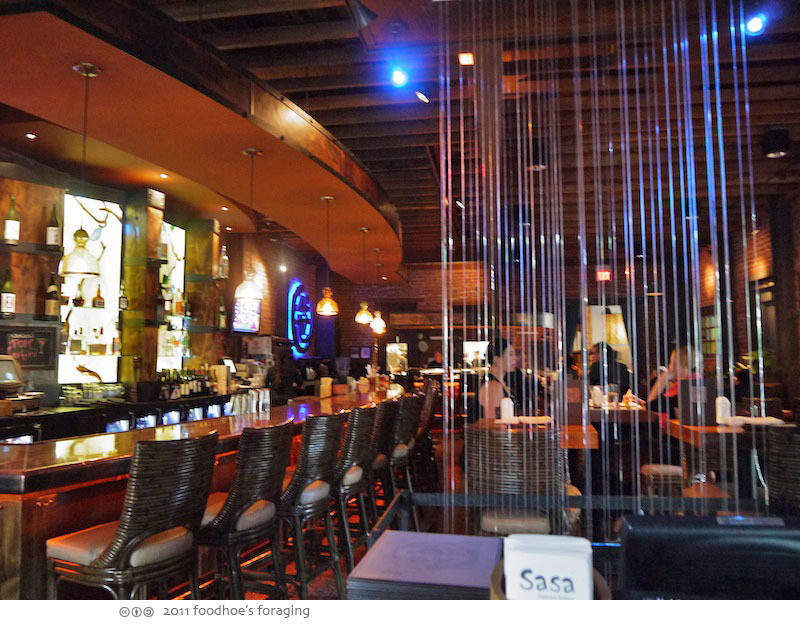 I went with my co-worker Chris to check out Sasa, a newish Izakaya restaurant in Walnut Creek. It may be the only Izakaya in the Creek and I wasn’t able to convince any others to join us as they were all confused when I told them it was a Japanese restaurant that specializes in small plates, but not bento boxes. This type of Japanese cuisine has been around for a long time – traditional pub fare featuring savory snacks that are meant to be consumed with sake or cold beer. 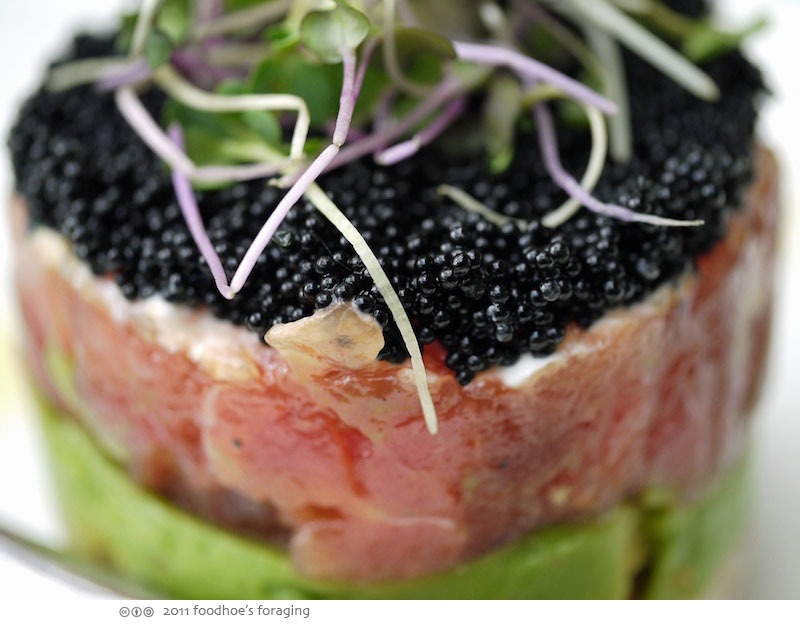 It has gained popularity almost to the point of toppling the sushi bar off its pedestal (perhaps a good thing with all the over-fishing being talked about). The small dishes in izakayas typically come in traditional forms of tempura, simmered dishes called nimono and grilled dishes like yakitori skewers. Chef Philip Yang (proprietor & owner of Blue Gingko in Lafayette) opened Sasa in March 2010 and prepares Japanese influenced dishes from around the world. The chef de cuisine, Sam Castro is a native of the Philippines has worked at many Japanese restaurants, as well as the now-closed French inspired Asian Restaurant Azie. 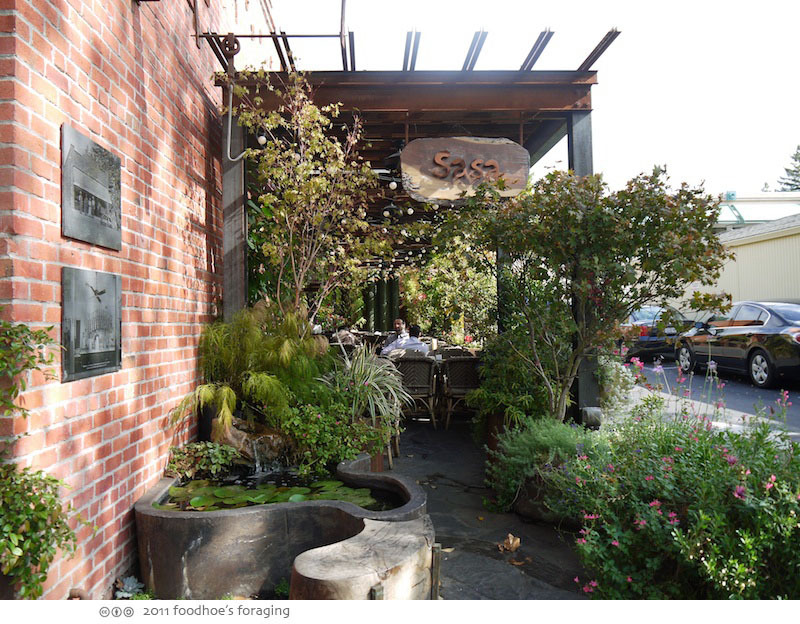 According to their website, Sasa Izakaya has received a Michelin Star recommendation, voted Best Sushi in Walnut Creek 2010, Top ten restaurants in the East Bay 2011, and is host to the 17th best bite (out of 101) in the Bay Area. The bar is large with dramatic lighting and the sleek modern dining room stretches out beyond view. Although there was a chill in the air, we sat out in the beautiful patio which is surrounded by lush foliage and a blurbling fountain (and has overhead lanterns which kept the temperature comfy). Underneath the greeenery, the arbor is industrial and modern and there were interesting gas lanterns filled with spiraling flames. 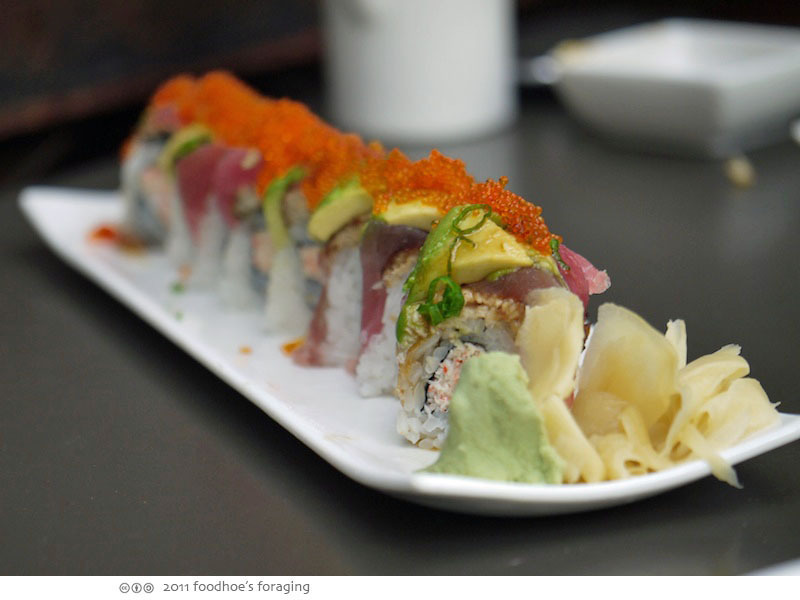 The menu offers a variety of omakase lunch courses, ranging from $6 for one, $11 for two, $15 for three course prix fixe lunch where you select dishes from a list of 15 delicious sounding plates. The portions are substantial and designed to be shared. 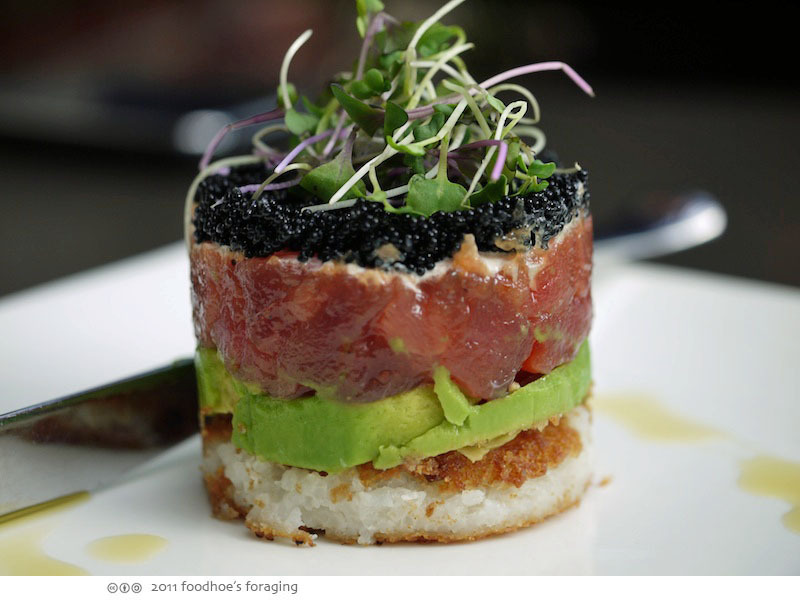 We began with an appetizer, Spicy Ahi Parfait ($11), layered with avocado, crème fraiche, crispy mochi rice, black tobiko, lemon oil. My coworker Chris thought I needed to take a really closeup shot, so I handed him the camera. Yep, that’s very up close. The tuna was bathed in a slightly sweet soy dressing and I loved the crunchy rice cake bottom. Next we each ordered the 3-course omakase to maximize our dining options, which meant we shared six different plates! 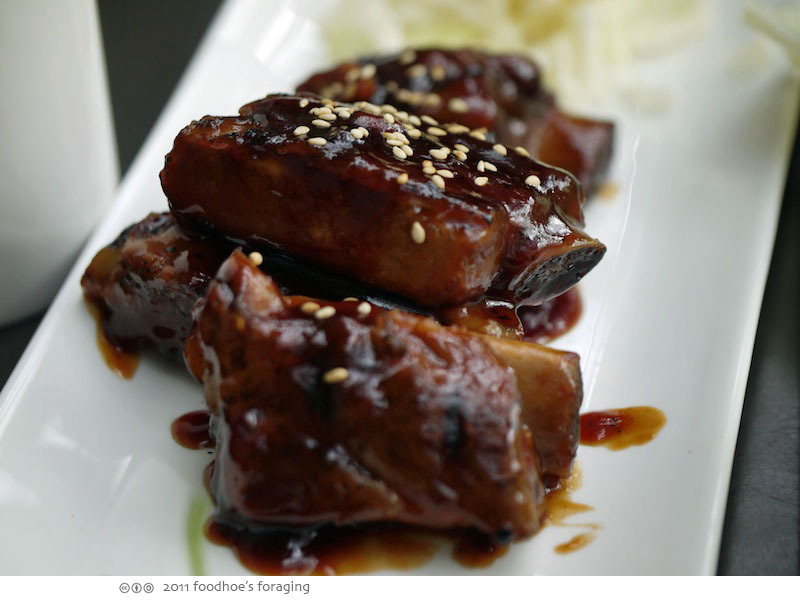 The Spicy Grilled Babyback Riblets were infused with a savory hoisin sauce and were fall of the bone tender. They were finger licking good. 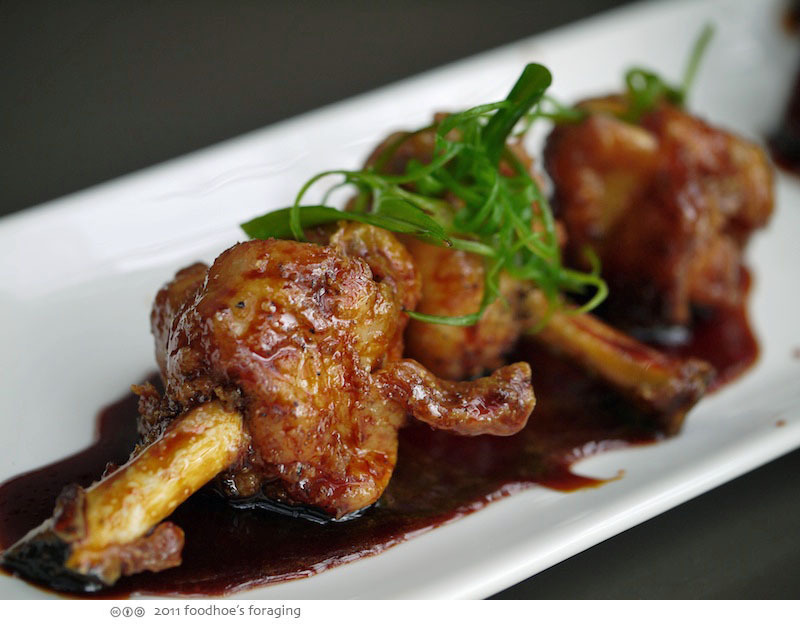 The Chicken Lollipops (3 pcs) that were crisp from the fryer and then coated in an addictively sticky sweet soy sauce glaze. These are also very recommended. 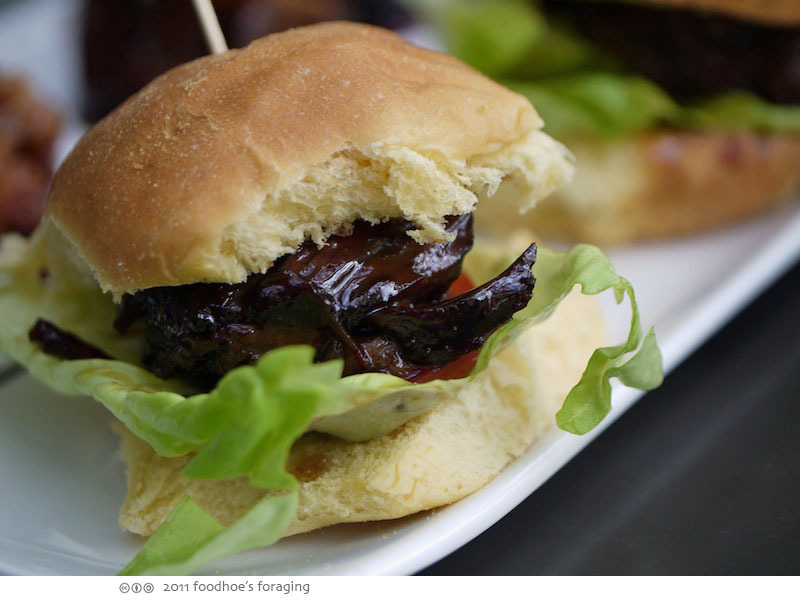 The Soy Braised Short Rib Sliders (2) were almost too strongly flavored, the tender flesh was shiny and dark, almost lacquered, tucked into pillowy soft buns with lettuce and a slice of tomato. Chris wondered if it was potato bread, it seemed like King’s Hawaiian sweet rolls to me… I would have liked a spicy coleslaw rather than iceberg lettuce for the vegetable crunch. I opted for the Seared Albacore Tuna Salad, which I mostly ate by myself. 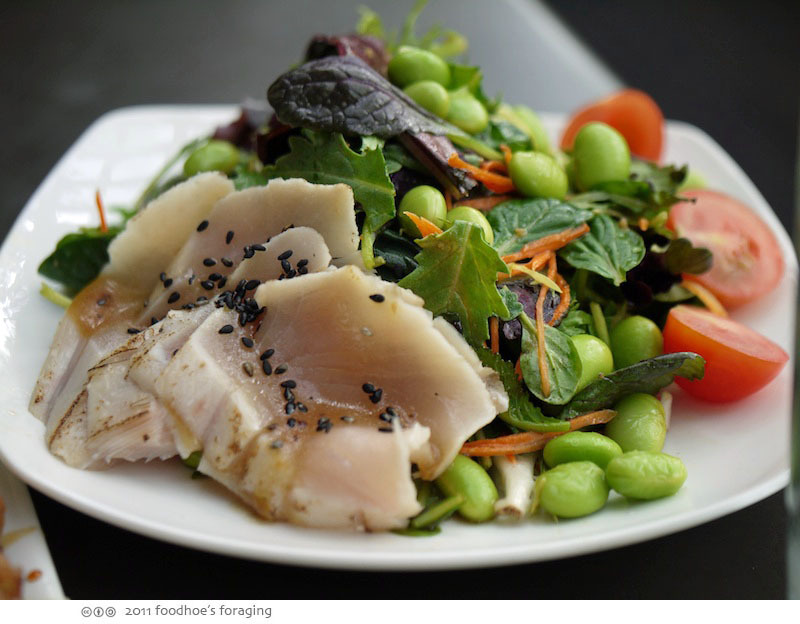 It was a mound of crisp fresh greens, edamame and tiny halves of cherry tomatoes dressed in a sesame vinaigrette. 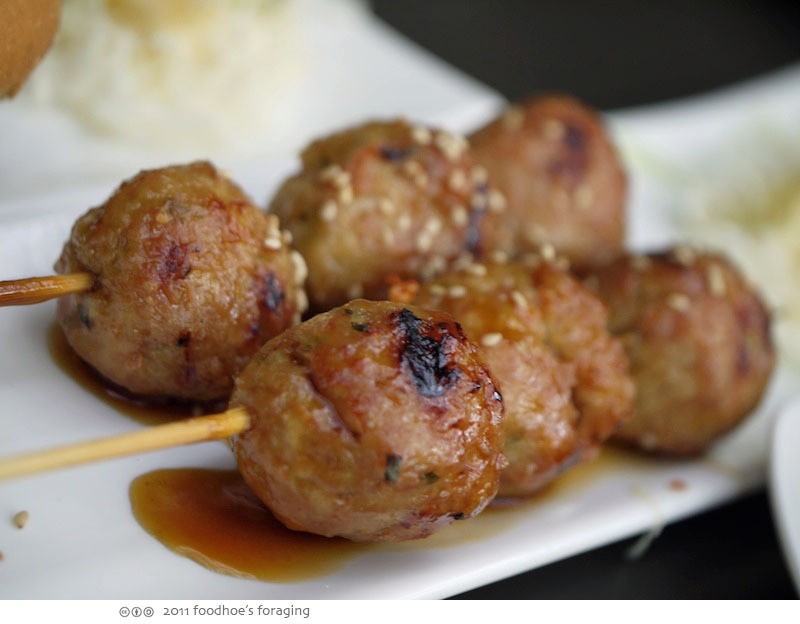 The Ginger Chicken Meatball Skewers (Tsukune), were deliciously chewy and filling. It reminded me of comfort food my grandmother used to make for us, served with rice and a bowl of steaming hot miso soup. 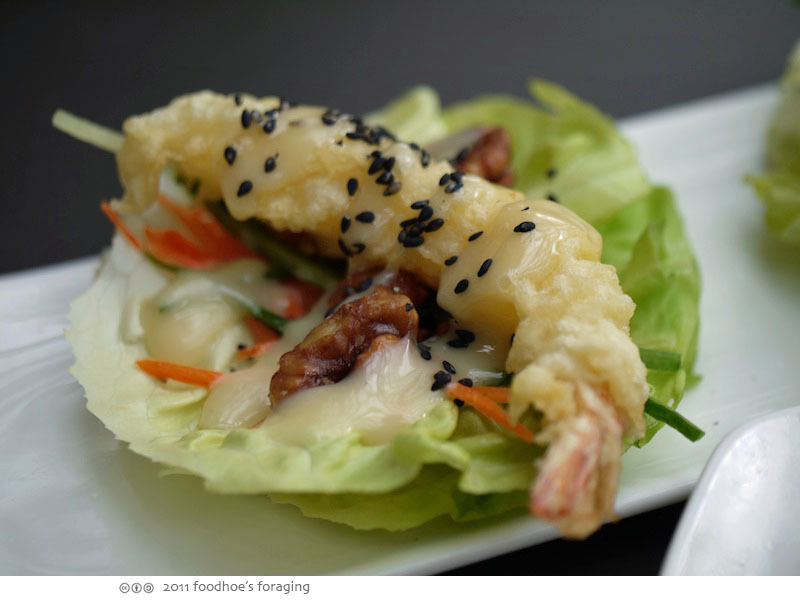 The Tempura Prawns Lettuce wrap, was drizzled with a sweet and sour miso sauce and served with caramelized walnuts. It was very similar to the honey walnut prawns served in Chinese restaurants, but distinctly different. I liked the lettuce wrap and fresh vegetables, although wished it had a little bit of a kick like fresh cilantro or green onions. 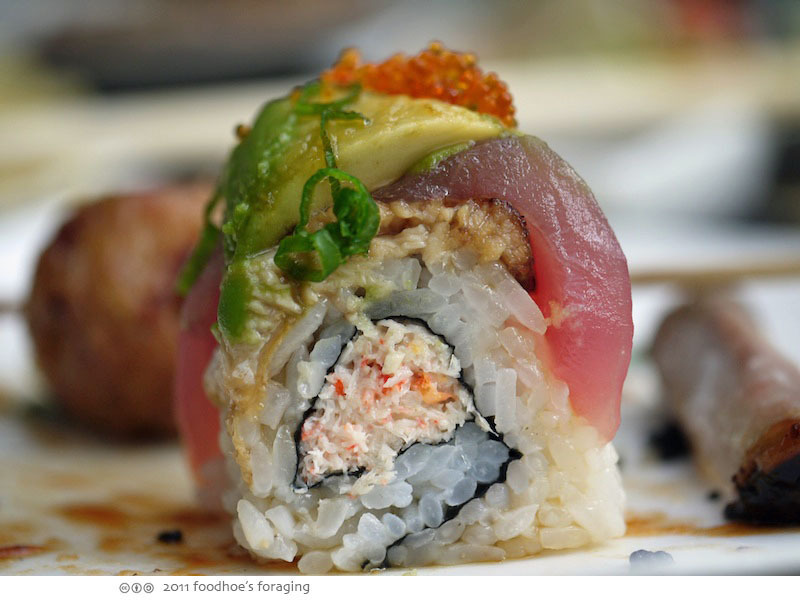 When we were ordering, our server assured us that the portions were quite generous and that we should be fine with the 3-course omakase and appetizer, but we were non-believers and ordered an additional sushi roll, the All Season Roll ($17), crab, tuna, avocado, bbq eel (unagi). Our lunch with tip was about $35ish each, and we ordered more food than we could comfortably eat. In retrospect, the 3-course lunch for $15 is an excellent value for the quality of food and generous portions. I would recommend that you bring someone with you so that you can share, as each dish had more than enough for one. 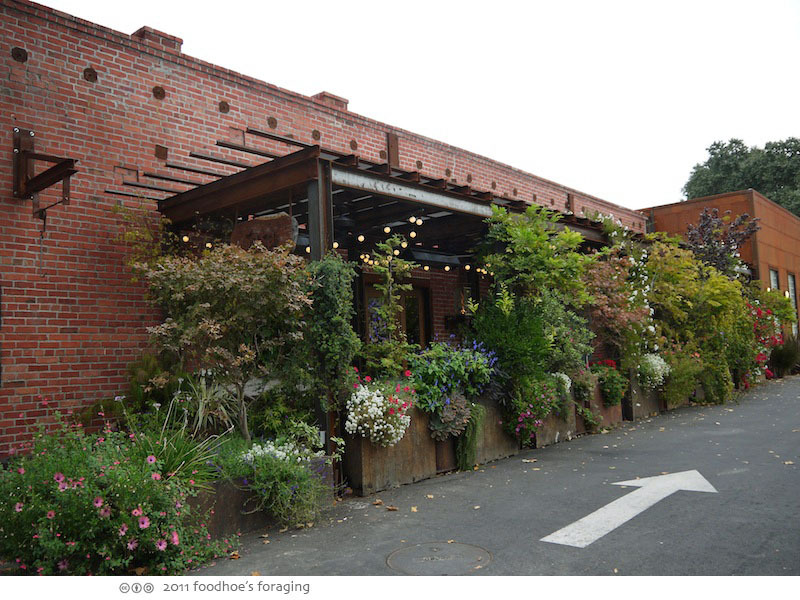 And if the weather permits, sit outside in the patio, where you can enjoy the food in a gorgeous garden setting. This meal looks fabulous, indeed! You are just living it big for lunch there in CoCo County huh? 😉 The tuna parfait looked really interesting, good thing your co-worker got a close up shot. I agree that izakayas are taking over the sushi bars, but it’s nice to get a mix of Japanese restaurants so it’s not always sushi. Rosa, it was very fabulous. Ben, I’ve been very bored with my lunchtime rotation recently, and decided to explore the next tier up of restaurants. It was a bit spendy, but the 3-course lunch is quite reasonable for the quality of the food. Nice to find you, I’ll be reading more!